With over 400kms of marked trails, just in this area of the Dolomites, a week's walking from here allows you to discover the awe-inspiring beauty of this region. Amazingly, all of this is accessible on well-defined and well way marked paths either directly from the hotel, using the hotel's shuttle service or via a short bus or cable car ride. This area is steeped in WW1 history with some of the hardest fighting taking place between Italian and Austro-Hungarian troops in the mountains nearby. There is a WW1 Museum located in what was an Austro-Hungarian fortress and there are still tunnels that can be visited on the Lagazuoi mountain (although you do need a head for heights for this). Famed for its varied cuisine - a mix of Italian and Austrian for the most part - Alta Badia has three restaurants with a total of 6 Michelin Stars between them, in just 15sqkm (5 stars between 2 restaurants in San Cassiano itself). The 2 Michelin Star restaurant just happens to be one of five restaurants in the Ciasa Salares, your home for the week, located just a short walk (or even shorter shuttle/bus ride) from the centre of San Cassiano. Run by the Wieser family, Stefan, Wilma and their son Jan Clemens, who is passionate about the hotel's fantastic wine cellar, they manage to combine alpine chic in the decor with good old-fashioned hospitality. The five restaurants include an informal wine bar, a terrace restaurant, a main restaurant, tables in the wine cellar and of course the 2 Michelin Star Siriola restaurant. There are also two other very special rooms - the Cheese Room and the Chocolate Room. Other facilities include a library and lounge, a luxurious spa with indoor swimming pool, relaxation area, treatment rooms (3), sauna, steam room and an outdoor hot tub to soak away those aching limbs after a day of walking. The walking in this area is primarily on well-tended and well way-marked tracks. There are narrower paths that run through the pine forests and in others where the tracks enter the local villages where you'll be walking on tarmac for a while. There are moderate ascents on most days, and longish descents on days when a cable car is used to gain altitude. Walkers should have a good fitness level and be confident on uneven terrain - a couple of the suggested walks may be unsuitable if you have a fear of heights, however other options are possible. In the unlikely event of extreme bad weather, cable cars may not operate. Walking boots are essential and walking poles are recommended. Some of the higher level walks may have snow in early/late season. 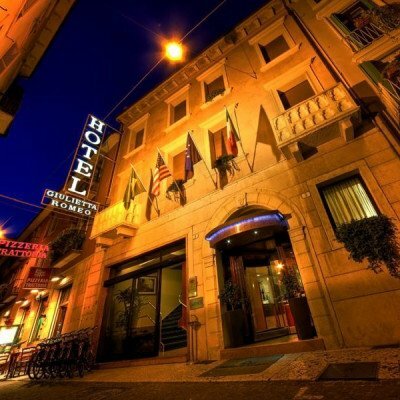 Arrive at your hotel in Armentarola, San Cassiano. As you're at the same hotel all week the below itinerary is only a suggestion and you can, of course do any walk on any day. 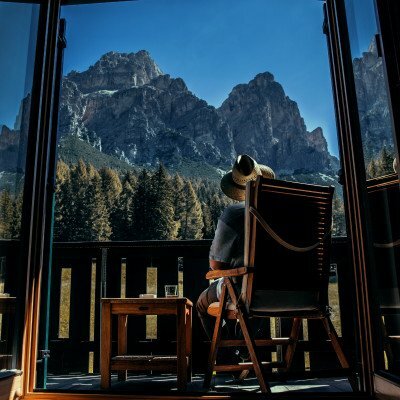 From the hotel, you ascend steadily along peaceful country lanes, through pine forest and up onto high alpine meadows with spectacular views of the surrounding Dolomites mountain ranges. Either enjoy a picnic en route or when you reach the mountain hut at Pralongia, take time over lunch and soaking up the mountain panorama. Return to San Cassiano for the hotel shuttle or walk back to the hotel. Walk directly from the hotel or take the shuttle to San Cassiano. This pilgrimage route first skirts above the village then heads through some delightful pine woods. Along the route you pass depictions of the last hours of Jesus Christ's life on earth before you reach the church at Santa Croce with its amazing backdrop and views across the valley and the village of Badia. Descend to Badia and take the bus back to the hotel. Enjoy truly spectacular scenery on this favourite Alta Badia trail. You can start the day with a gondola lift or you can climb the first 5km through pine forest and alpine meadows. Once up at the top there are fabulous views ahead to the Marmolada mountains, the highest in the Dolomites, and behind as far as the Austrian Alps in the distance. At some points you have the most incredible 360-degree panoramic views. Continue on with a variety of mountain hut options for lunch then descend to Corvara for a well-deserved drink before catching the bus back to the hotel. A short bus trip to Badia before this lovely walk takes you to two small lakes close to Badia with the fabulous backdrop of the Somamunt, Col Plo Alt and Pre Janin mountains. There are some wonderful views over the village and across the valley to the Santa Croce mountain as you head to Lech dla Lunch (pronounced lek-dela-loonk). Bring a picnic and you could even stop here for loonk! A steep climb sets you on your way to Lech da Sompunt and its delightful swans. Descend back to Badia passing through tiny hamlets and take the bus back. Today you head up to one of the key strategic passes from WW1 â€“ the Passo Valparola for fabulous views over the San Cassiano valley. Heading through the delightful Pre de Costa meadows, and past the Malghe Valparola, you head up towards the pass. When you get there, you may want to stop for refreshments at the rifugio at the top. You can make this a history trip and continue on to the nearby WW1 museum or even to Passo Falzarego and a cable car up to the top of Lagazuoi â€“ one of the most fiercely fought over mountains in the Dolomites. Another alternative is a tough 13km walk across towards the Setsas mountain with more fabulous views and back to the hotel. Defintely worth the wait - the Fanes Natural Park is a huge expanse of outstanding natural beauty. You can either walk directly from the hotel or get the shuttle to the Capanna Alpina hut before starting the steep climb up to the panoramic Col de Locia. The verdant plateau beyond (Plan de Ciaulunch) and the climb up to the Forcela dl Lech provide awe-inspiring views of the surrounding mountains and a sparkling, aquamarine mountain lake. You need a head for heights on this one as you descend via two steep gorges, with well trodden paths, to the Scotoni mountain hut and down a spectacular ski slope to the start point. 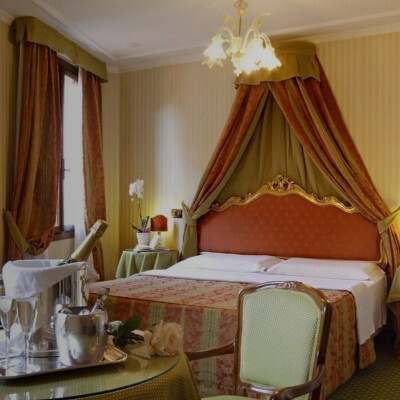 Selected Saturdays from 8th Jun 2019 to 21st Sep 2019, for 7 nights. All dates are subject to availability, please contact us to check. You should allow approximately €40 for local bus fares and any cable car and gondola journeys during the week - the cable car and gondolas are optional however some of the suggested walks require bus travel.